Despite campaigns like Bachpan Bachao Andolan, the employment of children in firecracker units is rampant, endangering their health and lives. What is the one image that comes to your mind when I say the word ‘Diwali’? For most, it is lights, festivities, and celebrations. However, Diwali is not the same for everyone. On one hand, we burst crackers to celebrate the victory of good over evil, on the other hand, we are guilty of propagating a major social evil — child labour. Bursting firecrackers is the same as burning the childhood of the children who die due to accidents and inhuman working conditions in firecracker factories. Local governments say that child labour has been curbed and is now at less than one percent of all employment. Kailash Satyarthi, Nobel Peace Prize awardee disagrees. He claims that more than a lakh children are employed in factories producing firecrackers — not just in Tamil Nadu, but also in Uttar Pradesh, Andhra Pradesh, Odisha, Chhattisgarh, Rajasthan, and Assam. It was in 1991 — when Bachpan Bachao Andolan (BBA) initiated the first ‘anti-firecracker campaign’ —the plight of children involved in the manufacturing of firecrackers came to fore. 10,000 schools and about six to seven million children were sensitized during this drive. The slogan raised during the campaign was ‘Deep jalakar Diwali banaye, bachpan jalakar nahin’ (Light a lamp to celebrate Diwali — don’t burn a childhood). It was a consumer campaign where the injustice meted out, to the children employed in these factories, was depicted by dipping firecrackers in water. Picture for representation (Photo: Reuters). These child labourers lost their lives to frequent accidents in the firecracker factories. During the campaign, BBA visited schools and public places to spread awareness about the occurrence of child labour in firecracker factories through street plays and series of discussions. The street plays — besides depicting scenarios in factories where children were employed— ended with blasts in the factory where the children died. BBA raised the question to the audience — would you burn these crackers that has resulted in thousands of children deaths? Consequently, though self-monitoring started in firecracker factories, another problem emerged. Factory owners started outsourcing their work to home-based factories. While the number of children being sent to factories was reduced marginally, home-based firework production enabled through a network of contractors and sub-contractors gained momentum. In 1998, at Dadri in Uttar Pradesh, an accident at an illegal home-based factory of firecrackers caused a blast in a residential colony. 62 of such illegal factories were identified by BBA in Dadri alone, which were working without a license. The police then constituted an inquiry and conducted raids to stop such factories. 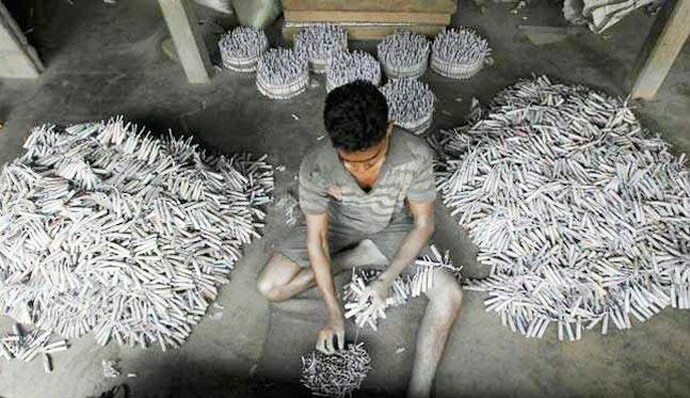 While the number of children employed in the firecracker factories has reduced, the problem still persists. BBA is working tirelessly to save every child from labour and exploitation and make the world a safer place for them. Article 24 of the Constitution of India states that no child shall be employed to work in any factory or mine or engaged in any other hazardous employment. The reality, however, is quite dark. Children — in uniforms — are seen at manufacturing fireworks after school hours. Slowly, the children are completely deployed in these production units — losing out on their education. They continue to remain ignorant of the benefits of education which include a decent living without any damage to their health and development. The economic evil of employing children includes the denial of minimum wages and disguised employment. Tamil Nadu has been in the limelight for long for its child labour problems. Children were falling prey to the exploitative labour in firecracker and matchsticks-producing industries. In 2012-13, a major fire accident occurred in Sivakasi, where both — children and adults — lost their lives. The incidents of employing children in such factories may have reduced since then, but they have not stopped. As recently as on October 23, 2018, four people died in an illegal firecracker manufacturing unit in Tamil Nadu. In 1996, according to the MC Mehta Judgment, the Supreme Court issued certain important directives to ensure compliance with the Child Labour (Prohibition and Regulation) Act, 1986. As per the law, an employer must pay a sum of Rs 20,000 as compensation for every child employed in contravention of the provisions of the Act. This act covers a list of hazardous occupations and processes, which prohibit employment of children under 14 years and includes fireworks and match industries. Despite the law, the NCPCR 2012 report states that children in the age group of 5 to 15 years work for more than 12 hours a day in the firecracker units, and earn a paltry sum as wages for their back-breaking work. Children in these factories are generally paid on a ‘piece-rate’ basis. Payment per piece is very low, and thus they are indirectly forced to work faster and longer which also affects their health and nutrition. For every cracker that lights up the sky this Diwali, some child somewhere is living his or her life in the darkness of the cracker industry. If you wish to do your bit to eradicate child labour, take a pledge this Diwali and say ‘No’ to firecrackers. communications professional and a women and child rights activist.